The Changemaker Challenge mirrors an international effort to educate individuals and groups of people in hopes of equipping them with the skills and knowledge to holistically understand an issue that they’re passionate about solving. 2. Create a sustainable solution to a Social Justice and Fair Distribution problem. Each part of the challenge, problem and solution, will be a separate competition and will have a pool of $2500 in prize money ($5000 total). Students can enter either part of the competition – or compete in both parts. Please visit http://sustain.cofc.edu/changemaker-challenge1/index.php for complete details and links to register. We are the only master’s-level school in the U.S. to be included as a top producer of both Fulbright Scholars and Fulbright Students. 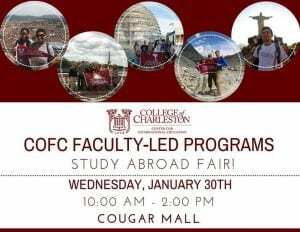 Join us Wednesday, January 30 from 10 AM to 2 PM in Cougar Mall to learn about CofC Faculty-led programs at the Study Abroad Fair hosted by the Center for International Education. Open educational resources (OER) are classroom resources with no copyright restrictions. They are in the public domain, licensed through the Creative Commons (or similar intellectual property licenses) or library-licensed, so students can access them at little or no cost. Textbook prices are rising rapidly, putting enormous financial strain on students. OER can help mitigate textbook expenses for students and also provide instructors with pedagogical advantages, since they are more adaptable than traditional textbooks. In order to encourage faculty to integrate OER materials in their courses, the OER Faculty Incentive Program will award grants of $750 to instructors selected by the campus OER Committee. Faculty who are awarded OER incentive grants will integrate OER into their fall 2019 course(s). The deadline for submission of applications is February 15, 2019. For more information and to apply, go to http://academicaffairs.cofc.edu/research/index.php#oer. The 2018-2019 College Reads! book selection is The Hate U Give by Angie Thomas (HarperCollins, 2017). Author Angie Thomas will be on campus Monday, January 14, 2019 for a talk entitled, “The Hate U Give: Finding Your Activism and Turning the Political into the Personal,” before participating in a Q&A. The event begins at 7 PM in the Sottile Theatre. This event is SOLD OUT. Walk ups will be seated 5 minutes before showtime on a first come, first served basis depending on availability. The 2018-2019 College Reads! book is The Hate U Give by Angie Thomas (HarperCollins, 2017). New York Times Bestselling Novelist Angie Thomas is a former teen rapper with a BFA in Creative Writing and an unofficial degree in Hip Hop. Thomas became an award winning author with her debut novel, The Hate U Give. With over two years on the NYT Bestsellers list, The Hate U Give was adapted into a critically acclaimed major motion picture in 2018 featuring Amandla Stenberg, of the Hunger Games, in the lead role as Starr Carter. Incoming students received a copy of the book and an interactive Reading Guide. Students were asked to prepare for Convocation by reading the book and selecting one Convocation Project to complete and submit during their small group discussion. Author Angie Thomas will be on campus Monday, January 14, 2019 for a talk entitled, “The Hate U Give: Finding Your Activism and Turning the Political into the Personal,” before participating in a Q&A. This was a change from the previously advertised date in mid-October, since the feature film based on the book was scheduled for wide release on October 19. Angie Thomas attended several film premier events that week, including one in her hometown of Jackson, Mississippi. The newly scheduled “Evening with Angie Thomas” will be at 7:00pm on 1/14/19 in Sottile Theatre. Provost Brian McGee has been named the 24th president of Quincy University starting July 1, 2019. To learn more about Provost McGee’s tenure at the College, please read The College Today story. 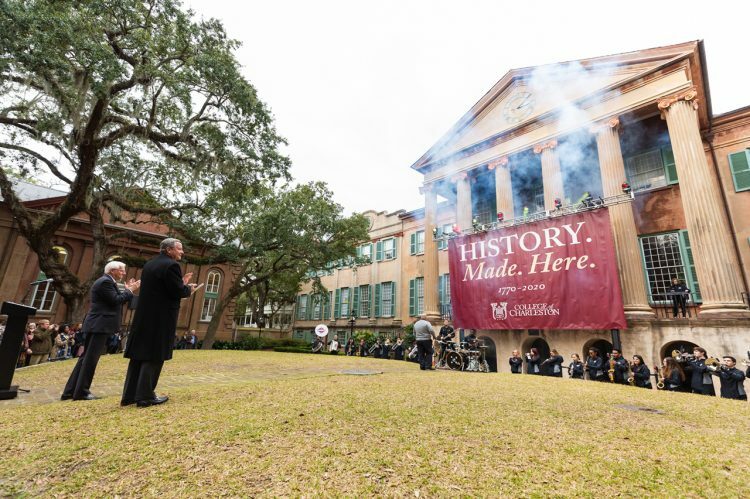 We are pleased to announce that the Board of Trustees elected Andrew T. Hsu to become the 23rd president of the College of Charleston. The College now has a password recovery/reset tool. Starting November 29, CofC users will be required to perform a one-time setup of their password tool by entering two authentication methods (e.g., phone number and email) during the next time they log into Outlook or another Office 365 application. The first method will be displayed is the option to download the Authentication App, but you are welcome to choose the “Choose security info” button to change your methods to have a code texted or emailed to you. Go to password.cofc.edu for more information.